HONDA’S boldly-styled Bulldog concept is going to become a production model, a dealer source has told Visordown. Looking a bit like a grown-up version of Honda’s Zoomer scooter, the Bulldog uses the chassis and parallel-twin engine from a CB400F, the smaller Japanese-market version of our CB500F. 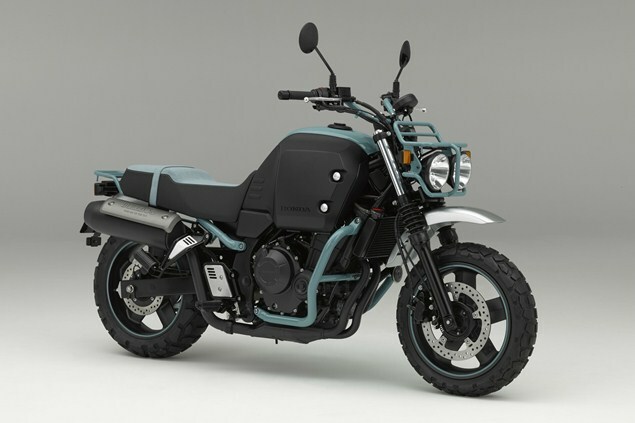 It was shown as a concept at Japan’s Osaka Motorcycle Show in March, where Honda gave it the curious title of ‘Lovable Touring Partner’. With two carrier racks and storage compartments on either side of the tank, and 15-inch wheels for a low seat height, it could make a sort of novice-friendly alternative for would-be adventurers worried about dropping a GS.